There is absolutely no better way to really appreciate the might of the Victoria Falls than from the air. 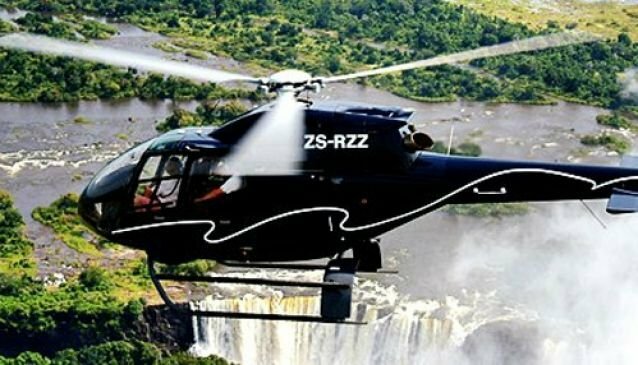 United Air Charters offers spectacular helicopter flights over the falls in such a way that the passengers on both sides of the helicopter are able to view and photograph the Victoria Falls. The pilot will then fly upriver to Long Island and the Mosi Oa Tunya National Park. If you opt for the Long Flight you will start your flight with a trip down the Zambezi Gorges as far as rapid 26 before the flight over the falls and upriver. For Romantics the Champagne Flight for two, the pilot will drop you and your partner off at an isolated spot for a picnic or a glass of champagne, either with or without a waiter, and return at a prearranged time to collect you.